Blues riffs licks and songs have served as a great platform for many guitar players for many years, no matter how a technical a run or flurry of notes can be, placing a blues phrase or lick at the end always grounds the passage and brings the listener back to a familiar musical place. Regardless of whether you are using blues licks in a rock or metal genre or playing pure blues you can never have enough blues licks in your repertoire. 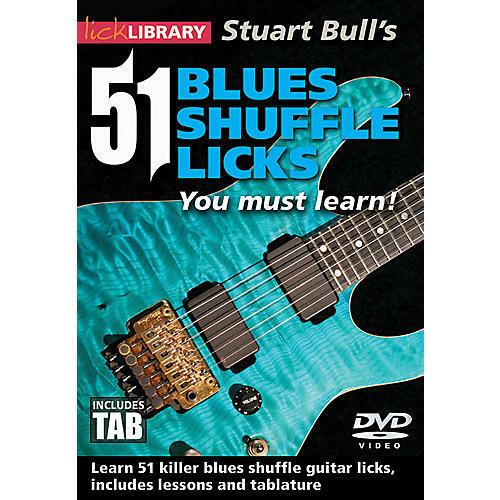 This DVD offers 51 great usable licks in the shuffle rhythm. This style forces the player to deliver licks and phrases that offer taste and timing to the ear of the listener. By learning these licks you can build an arsenal of blues motifs that can be puled into other styles or simply played along with the included backing track. This DVD offers fun, education and above all great licks. Whatever your style there is something here for you.